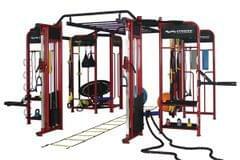 Functional Trainer Commercial 360PTA comes with upgrade STEEL (not plastic) twin 100kg (220lbs) pin select weight stacks, total weight 440lbs. 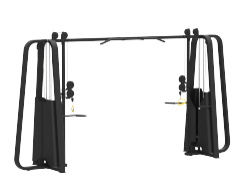 The Functional Trainer Commercial 360PTA is the complete package for your own home gym, Personal Training Studio, Health Club or work gym … it’s got the lot. 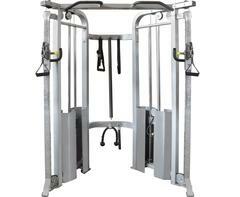 We stock the most complete range of Functional Trainers in Australia. 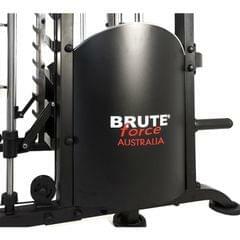 The Functional Trainer Commercial 360PTA by BRUTEforce® being our premier ‘Top of the Range’ model. A cleverly designed “all in one” combo of the three major exercise structures (Smith machine, Twin Weight Stacks Functional Trainer and Power Rack) the Functional Trainer Commercial 360PTA allows you to keep up with and do the latest exercise and training programs as well as all the tried and true basics. With a surprisingly small footprint (floor space) and constructed from the highest quality steel by top craftsmen, this is truly a unique concept. 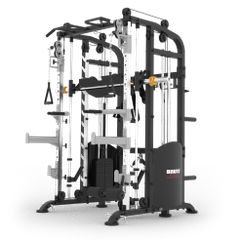 Functional Trainer Commercial 360PTA Features at a glance. 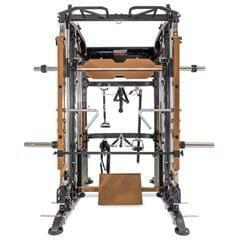 Commercial Functional Trainer (2 x 100kg STEEL pin select weight stacks). Commercial grade J Hooks and Spotting arm. Five way multi Grip Chin Up Bar. Includes 14 bar and handle attachments. Compact footprint: 220cm (width) x 142cm (length) x 222cm (height). 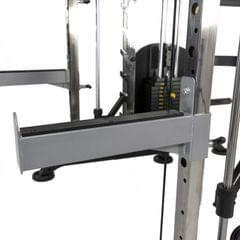 The Leg Press plate in an optional extra and not available on all models, please ask our sales person. 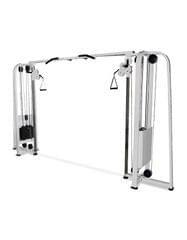 Functional Trainer Commercial 360PTA in more detail. 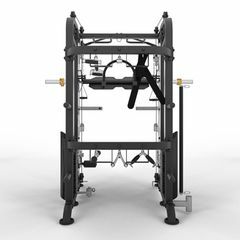 Commercial Functional Trainer has 2 x 100kg precision cut weight stacks with 5kg increments, Commercial Grade aircraft cable (rated 1000kg) and pop pin for quick and easy weight selection. Fitted with 11.5cm full commercial grade pulleys with sealed bearings for a smooth motion. Also included is a huge range of attachments (bars, ropes and harnesses) for almost any exercise. 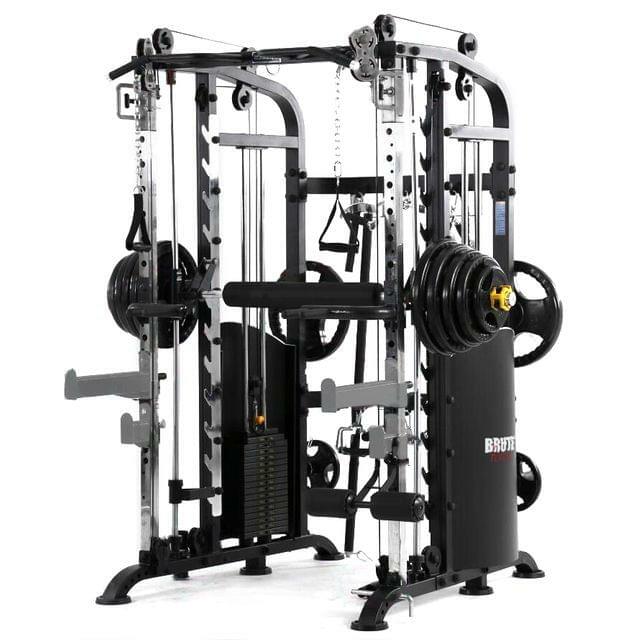 Commercial Smith Machine, superior design and engineering ensure a safer and more natural range of movement when the body is in action. We only use the best 25mm self-aligning linear bearings. Also stainless steel safety pins, hardened chrome finish for all main moving ware parts and 8mm super strong stainless steel carabiners. 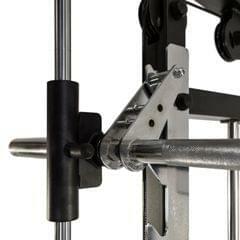 The Smith Machine bar has a 30mm diameter. 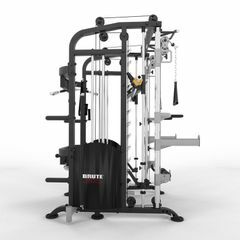 To allow you to work to your max the Functional Trainer Smith machine 360PTA has band pegs positioned for extra assistance or resistance. Rubber resistance band pegs are placed along the top and bottom, extending out along the front foot bar. Bands can be used Squats, Deadlifts, Bench Press, Rows, Lunges, Chin Ups, Shoulder Press, Rotator Cuff exercises, Bicep/Triceps and heaps more. 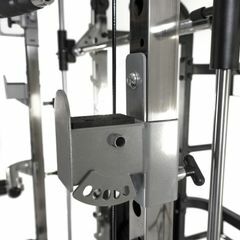 Heavy Duty Power Rack fitted with “spotting arms” (safeties) and commercial grade J-Hooks that are quick and easy to remove or adjust. Both J-Hooks and “Spotting” arms have 8mm thick nylon stripes to prevent metal to metal contact and complete with safety pins. 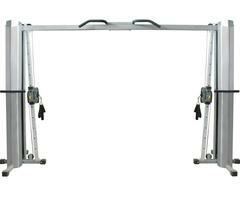 Multi Grip Chin Up Bar has 5 hand grips to suit long and short arm spans and to give a variety of grips. Weight Plate Storage Rods, the 2 rods are made from High grade nylon and placed at the rear of the unit to hold your weight plates when not in use. 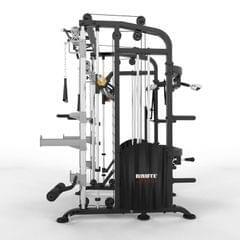 Attachment Storage for handles, harness, dipping grips and spotter arms all of which are included with our Functional Trainer Commercial 360PTT. 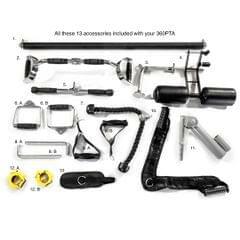 Fixing Ring for TRX etc., is front and center it offers a great fixing point for a variety of training tools. Compact Footprint. Even with all of its features and all the functions it can achieve, it still only occupies; 220cm (width) x 142cm (length) x 222cm (height).